Figure 1. 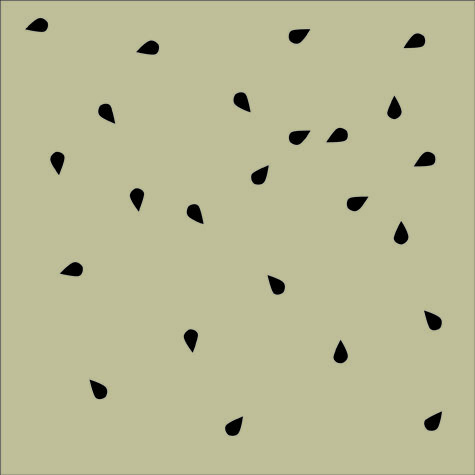 In this experiment the mussels are initially distributed in a random pattern on an artificial rock. Figure 2. After exposure to the stress of breaking waves the mussels have formed clumps. Small clumps provide protection from wave action while the concentration of algae food in the water is not decreased significantly by the crowding. Larger clumps would presumidly give greater protection from the waves, but this would be more than offset by the lower concentration of food resulting from the larger clumps. September 2011: How mussels move. In "Life on the Dock", page 25, I describe the byssal threads that the mussel makes to anchor it to the Dock. You might think that these threads are made when the mussel is young and remain attached through out its life. However, I mention that I removed adult, i.e. large, mussels from the dock and put them in an aquarium with sea water. My intent was actually to study organisms that were on the mussel shell, but the next morning I learned something about the mussels themselves. During the night they had made new byssal threads and were firmly attached in a corner of the aquarium. This observation suggests that even adult mussels can move, even when movement requires production of new byssal thread attachments. Thus the pattern of mussels on the Dock may be the result of a dynamic process, which is just too slow to be easily recognized. In a recent paper, "Levy Walks Evolve Through Interaction Between Movement and Environmental Complexity", by Monique de Jager et al. [Science vol 332, pg 1551, 24 June 2011] the details of the movement of adult mussels were studied in a quantitative manner. Movement is motivated by two conflicting goals. First, mussels benifit by protection from wave turbulence; this motivates them to clump together. Second, mussels benifit by a high concentration of suspended algae which they eat by filtration; this motivates them to avoid neighbors who compete by depleating the water of algae cells. However, the distance scales of these two conflicting effects are different. An optimal distribution is clumps which contain sufficent animals to offer shelter from the waves, but of a small enough size to avoid undue competion for food. The Jager paper comments not so much on the final distribution, but rather on the movements mussels make to get to the final clumped pattern. The default guess would be Browian motion, the kind of motion molecules execute due to thermal energy and the motion that produces diffusion. 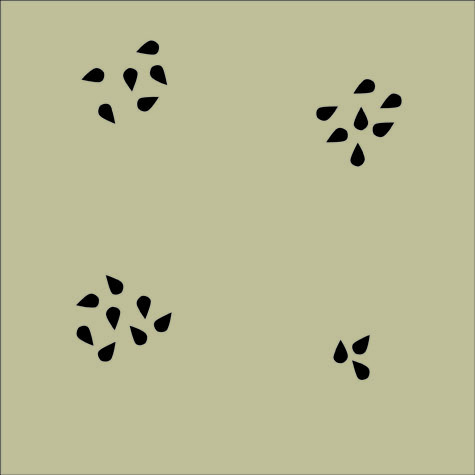 Brownian motion can be seen as a series of steps of equal length, but in random directions. In, for example 10 steps, it is extremely unlikely that a molecule would move ten steps in one direction. In 100 steps it is essentially imposible for the molecule to move 100 steps in the same direction. Thus Browian motion is a series of modest movements. In contrast, for a Levy flight [search on Google and click on the wikipedia site], the steps of the random walk are not a fixed length, but rather have a distribution with a tail toward long steps. This means that in several steps it is fairly possible to move in a long distance. The mussels are searching for an optimal distribution which maximaizes protection from the waves and minimizes compatition for food. This is just the kind of process that many animals have to carry out in order to survive. The Wikipedia article mentions that sharks use this kind of search when they are having trouble finding food. Of course humans often need to perform searchs if they don't have a good predictive rule for finding an immediate solution to a problem. If you are the captain of a submarine chaser you are happy if you have a difinitive fix on a submarine, then you just go there and drop charges. But most of the time you have lost contact and need to search. Then you should avail yourself of the large literature on the strategy of searches, and Levy flights should be considered. Howevr, I am not an experienced anti-submarine captain and can not comment on the actual efficacy of Leve flights for this purpose. In civilian life there are also many cases where you have to search. If you have a large data base, where similar items are close, you may have to search to find one particular item. You could go to the middle, and if you don't find the item move in what looks like the right direction. It may be better to take a mixture of small and large steps in your search. Search strategies are a huge area of research. The chemistry of byssal threads has been studied for many decades, but we learn more each year. Harrington et al. [Science vol 328, page 216, 9 April 2011] investigated the mechanical properties of the threads, and concluded that iron atoms were involved in cross-linking polymers in the threads. Although the iron represents a very small fraction of the material, the iron mediated links are "self healing", in that if they are broken, they reform easily, as opposed to typical covalent bonds. Also see the introductory article by Messersmith [Science vol 328, page 180, 9 April 2011] for a nice review. The same Messersmith that wrote the review metioned above, was also an author for the paper "Injectable candidate sealants for fetal membrane repair: bonding and toxicity in vitro", [American Journal of Obstetrics and Gynecology, Jan 2010, pages 85, 86]. The sealant described is not actually from mussel byssal threads, but rather is a synthetic polymer that was designed from what is known of byssal chemistry. Imatation is the greatest complement.